HP Umpire Chris Segal ejected Angels Manager Mike Scioscia for arguing a ball four call in the bottom of the 2nd inning of the Angels-Dodgers game. With one out and none on, Dodgers batter Yasiel Puig took a 3-2 sinker from Angels pitcher Andrew Heaney for a called fourth ball. Replays indicate the pitch was located over the outer half of home plate and thigh high (px .474, pz 2.293 [sz_bot 1.660]), the call was incorrect. At the time of the ejection, the game was tied, 0-0. This is Chris Segal (96)'s second ejection of 2015. Chris Segal now has 4 point in the UEFL Standings (6 Previous + 3 AAA - 1 Penalty - 4 Incorrect = 4). Crew Chief Tom Hallion now has -1 points in Crew Division (-1 Previous + 0 Incorrect Call = -1). This is the 141st ejection of the 2015 MLB Regular Season. This is the 64th Manager ejection of 2015. This is the Angels' 3rd ejection of 2015, T-3rd in the AL West (HOU, SEA 4; LAA, OAK 3; TEX 2). 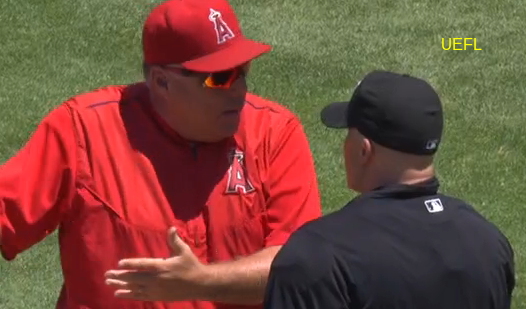 This is Mike Scioscia's 2nd ejection of 2015, 1st since June 12 (Chris Conroy; QOC = N [Safe/Out]). This is Chris Segal's first ejection since July 9, 2015 (Lorenzo Cain; QOC = Y [Balls/Strikes]).